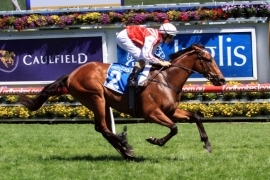 Swettenham Stud graduate Valliano cruised to victory in the $250,000 RL Inglis Premier over 1200m at Caulfield, becoming the first Australian stakes winner for his sire Equiano. It was also the first time his trainers, David Hayes and Tom Dabernig of Lindsay Park Racing have won the lucrative Inglis Race Series event, becoming the tenth individual training organisation to win the Inglis Premier race in the last ten. The gelding sat mid-field for the first three-quarters of the race, before he launched his offensive and claimed his spot in the lead at the 200m mark. He continued to open up and scored by two lengths ahead of Curvature and Lessyd. Prior to the race, Valliano (Equiano x Miss Valley Road) had already secured a coveted spot in next month’s Group 1 Blue Diamond Stakes, and today’s victory takes his record to a win and two placings from four starts, and in excess of $200,000 in prizemoney for owners S J Pickworth, N S & Mrs G C Psaltis, Evan P & Mrs Mandeep K Twomey, M Bateman, P McPherson, D B Paterson, Ms K J Smith and P M Cox, most of whom were present at Caulfield to watch the run. “Many of our loyal clients are involved in this horse, so it was great to get this win for them today. They are all incredibly excited for his future, and provided he pulls up well we look forward to running him in the Blue Diamond,” said Jason Timperley, Racing Manager for Lindsay Park. “We didn’t purchase him with a two-year-old campaign in mind, but every time we have tested him he’s done incredibly well,” Timperley added. Valliano was bred and sold by Swettenham Stud at the 2015 Inglis Premier Sale to Lindsay Park for $60,000, and stud Principal Adam Sangster is looking forward to offering his sister as Lot 624 at the 2016 sale in Melbourne next month. In addition to the prizemoney, Lindsay Park Racing receive a set of Swarovski Optik EL 42 Swarovision binoculars valued at $3,000. Damien Lane and Valliano’s managing owner also received an exclusive piece of Antler Luggage valued at $544. The $250,000 RL Inglis Premier is one of five events in the $5 million Inglis Race Series that carries black-type status. All yearlings offered at the Inglis Select Yearling Sales Series are eligible for entry into the lucrative Inglis Race Series. The 2016 Inglis Premier Yearling Sale will be conducted over four days on 28 and 29 February, and 1 and 2 March. 755 lots have been catalogued, including seven yearlings by Valliano’s sire, Equiano. To request a hard-copy catalogue please email catalogue@inglis.com.au or call Inglis Melbourne on +61 3 9333 1422.